I've waited with this blog post to kick off a second round of donations for this worthy project, aimed at measuring the impact of changing wildfire and industrial soot levels on snow and ice reflectivity. Because of a lack of government funding Dr. Jason Box from the Byrd Polar Research Center (here's his blog) is now trying to raise through crowdfunding the money that is needed to fly to the top of the Greenland ice sheet and take samples. This data is very useful, as the reflectivity of the Greenland ice sheet has been decreasing steadily for a while now. The effects of this decrease have been documented here and elsewhere around the web last summer, when practically all of the surface of the ice sheet was melting at some point, a rare occurance. Lower reflectivity of course means more melting, so reducing soot emissions might be a great help in slowing down the current melting trend of the Greenland ice sheet (and perhaps some of the Arctic sea ice melt as well), but for that we need to know how big a role soot is playing in all of this. You can donate at the Dark Snow Project website. Founded in 2007 by James Balog, the Extreme Ice Survey (EIS) is an innovative, long-term photography project that merges art and science to give a “visual voice” to the planet’s changing ecosystems. One aspect of EIS is an extensive portfolio of single-frame photos celebrating the beauty–the art and architecture–of ice. The other aspect of EIS is time-lapse photography; currently, 28 cameras are deployed at 13 glaciers in Greenland, Iceland, the Nepalese Himalaya, Alaska and the Rocky Mountains of the U.S. These cameras record changes in the glaciers every half hour, year-round during daylight, yielding approximately 8,000 frames per camera per year. We edit the time-lapse images into stunning videos that reveal how fast climate change is transforming large regions of the planet. There will be a donation button on this blog before the next melting season starts, as I've increasingly been having trouble justifying this whole endeavour to my wife. Quite right Neven, as you should. I was disappointed that there was no donation button here during the record-breaking melt of 2012 (both Greenland and Arctic sea ice). This year may or may not match 2012, but I am certain that the topics and discussion on this important blog will be even better. My donation will have to wait a few days until I've put some cash into my Paypal account. Is yours going to be paypal-only as well, Neven? If so, I'll put enough in to cover both. I don't say much on here, but you're all very well worth listening to. Thanks a lot. In the interests of clarity ... Jason Box is very well-funded via govt, Byrd and collaborative grants and deservedly so. This particular opportunity came up at the last minute and did not fit into the 2013 grant cycle. To my knowledge, no grant application was rejected nor would it have been -- it is an interesting proposal, very affordable science relative to blowing up a IceSat at launch, and the collaboration with recognized UCLA fire chemistry experts make the likelihood of success quite high. While the expedition has a notable public engagement and educational outreach component -- laudable but not pure dry science -- Arctic exploration has a long history of philanthropic backing. Cape Morris Jesup (yes, one 's') in extreme N Greenland was named by Peary after a 19th century bankster. PayPal? I'm in (but not at the level of Jesup). 2011	Mass budget closure on the global inventory of mountain glaciers and ice caps: Past and future sea-levels rise and streamflow variability, PI R. Hock, NASA grant, 08/15/2011 - 08/14/2014, Co-PI: J.E. Box (budget: $267,000). 2011	Collaborative Research: Long-term and Interannual Variability of Antarctic Ice Sheet Mass Balance from Satellite Gravimetry and Other Geodetic Measurements, 1 March 2011 - 28 February, 2014, PI: J. Chen (budget $599,000), Co-PIs: M. Bevis and J. Box (The Ohio State University, budget: $233,760). 2010	Recovery of data from the 5 August, 2010 Petermann Glacier breakup, $63,000, National Science Foundation RAPID grant, August 19, 2010 - 22 September, 2011. 2007	North Atlantic land ice mass budgets: 1958-2006, $652,000, NASA grant, Apr. 1 2007 – Mar. 31 2010, Co-PI: D.H. Bromwich . Hi, John Smith. Yes, donations will go via Paypal. My guess is that yes, they will find a good bit of wild fire soot from the last few years, but that most of the loss of albedo will be the result of recent snow melt exposing industrial soot dating back to WWII. The second largest source of soot will likely be heating and cooking fires from South Asia - the so called Brown Cloud. The third largest source of soot will likely be from cars & trucks, including tire wear. They will even soot from the 1991 Gulf War and the resulting oil fires. This old soot deposited year by year is exposed as increased amounts of water vapor melt the snow surface leaving the soot. The soot on the surface then decreases the albedo, vastly accelerating the melt process, and exposing older soot. Even if we scrape all of the black stuff off the surface of the GIS, restoring it to a pristine albedo, ongoing surface melt from latent heat will once again expose older deposits from forest fires and volcanoes. Once there a film of water on covering bare ice, the albedo plummets, and there is not much difference between the albedo of mature melt ponds and the albedo of soot covered snow. GIS as bare ice covered with a film of water is in the foreseeable future. This is the bottom line. This is what policy makers need to know. Knowing how much wild fire soot is being currently deposited on GIS is interesting, but does not inform policy. Quite right, though fuzzy snow layers simply don't provide enough annual resolution to resolve what we know must be there (from more orderly lacustrine sediments). 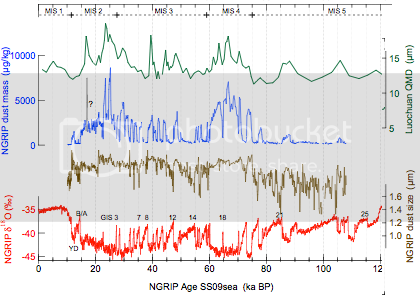 On much-studied GISP2, NGRIP and NEEM cores back to the Eemian, the dust layers are attributed solely to central Asian deserts, namely the Tarim Basin in the Taklimakan Desert of Mongolia based on isotope combinatorics. No dust on Greenland from the Sahara or southwestern US deserts. The loess quartz dust is primarily from Luochuan. On dated tephra, it is almost entirely attributed to known Jan Mayen and Iceland volcanic eruptions with rarely an Alaskan volcano invoked. If you have evidence for another scenario, please contact the analytic group at U Nevada. On soot, the primary proxies for wildfire origin are ammonium, formate, black carbon and surprisingly, vanillic acid (4-hydroxy-3-methoxybenzoic acid). Peat and conifer fires can be readily distinguished. The burning of fossil fuels in the northern hemisphere produces sulfate and nitrate salts in the cores. Not so long ago it was claimed that the Carrington Event of 1859 (enormous solar flare) would leave a nitrate spike; however that has been definitively rejected. In terms of justification for the Dark Snow field campaign, Box previously obtained clear-cut satellite data demonstrating deposition on Greenland from a nearby Labrador fire. Interesting discussion on Greenland albedo, folks. Is it correct to surmise that surface contaminants are retained and concentrated by snow melt, in much the same way that your French Press concentrates coffee grounds at the bottom of the column? Some great news for the Arctic Ocean! The Kulluk's hull is reportedly toast. It cannot even be towed from Kodiak to Seattle. While rocking off Sitkalidak, waves coming onboard also caused severe saltwater corrosion to the power plant, wiring, ventilation and internal control systems. Because a second drill ship must be nearby to drill a hypothetical relief well, the Noble Discoverer (still languishing in Seward, lawyered up against a multi-faceted Coast Guard investigation) cannot drill on its own. No contract with another 'Arctic-ready' drill vessels appears feasible. Thus, no drilling in 2013 and probably not 2014 as well. The Kulluk will sit anchored off Kodiak, attended by tugs Pt. Oliktok, Warrrior, Lauren Foss, Ocean Wave and Corbin Foss, the anchor-handling vessel Aiviq, oil service vessels Nanuq and Sisuaq, until calmer seas in April. This has to be costing something -- the idled Noble Discoverer alone is contracted for $240,000 per day. (grrr, typepad). One scenario has Shell bringing a gigantic ocean-going drydock over from Korea. Once inside, the Kulluk then undertakes a dicey voyage back to Malaysia, either to be repaired or scrapped,since major repairs are not feasible at Kodiak. Curiously its original destination in Puget Sound, Vigor Industrial shipyards, just ordered a huge new floating drydock on 15 Jan 2013 so it is possible that the Kulluk will be patched in Kodiak and end up there (say April 2014) for refurbishing. However the inside width is only 186' whereas the Kulluk is 300' wide at deck level. If, like McKibben and Hansen say, 80% of the world's fossil fuels need to stay underground, off-shore oil in the Arctic would be a good place to start. That's great news, A-Team. Thanks for the heads up! Box is responding here more to a reporter spouting off on grantworthy research than to specifics of a disappointing paper in Nature this week concerning the 2,540m NEEM core in northern Greenland. The article itself is not straightforward: messy data, convoluted technical arguments, and many sorts of modelling to get to a buzz-worthy conclusion: last time around (Eemian interglacial), most of the 6-8m sea level rise came from Antarctica, not the melting Greenland ice sheet. If so, that wouldn't be good news on future sea level rise because it requires melting of both West and East Antarctica. The paper seriously irked other scientists who had reached the same conclusion two years ago in a rival journal but were not cited. They had studied isotope ratios in the Eirik Drift, a contourite (sediment from thermohaline bottom currents) off southern Greenland. The NEEM core itself left a lot to be desired. To be frank, they chose a lousy drill site. Was that bad luck or belated recognition of the accuracy -- and thus necessity -- of a directly overhead Kansas ice penetrating radar track? They ended up working very hard getting a core folded over twice on itself as it slowly slid down from higher on the ridge -- no ice from 114–108 kyr, ice 118–115 kyr bp triplicated (twice upsidedown), and the last 90 meters an unforseeable fiasco (undatable, uninterpretable). The Eemian part of the core itself had melted; water had penetrated and refrozem many times, not to the benefit of annual layer analysis. Enough said, I'll just attach a figure or two to illustrate the issues. Way overdue, and may she be pleasantly surprised. Here is some complimentary code that generates an inline euro-denominated, fund-raising thermometer widget, courtesy of http://thermometer.fund-raising-ideas-center.com/ Now all you need is a link to a PayPal account. Thanks for the info on the NEEM paper, A-Team1 And thanks for the thermometer. That might be a good alternative to a donation button. What is going on with SIE? I know this is OT but did not know where else to post. The update was delayed for 4 days and now the results are strange. SIE has dropped 200 square kilometers. Charts are still two days behind. Are these errors? Circa 1970, the city of Albany, NY did a snow melt experiment, related to plowing roads. Soot from within the snow accumulated on the surface of the melting snow, lowered the albedo, and even great mountains of snow covered with soot disappeared in flash under the early April sun. (Leaving a film of soot.) When snow containing soot melts, the soot mostly accumulates on the surface of melting snow. Soluble constituents leach out during melt remodeling particles. The problem is even huge forest fires deposit tiny amounts of soot on the surface of the GIS. In contrast, every breeze with a dew point above 0C can result in extensive melt water films and pools that reduce albedo. There is so much more melt water, that it is the melt water effect on albedo that dominates, even when the soot is more apparent to the naked eye. This is not to say that a film of soot under a film of water is not an even more very powerful melt agent. Box is still thinking in terms of a GIS with dry cold. With loss of sea ice, every summer breeze will have a dew point above 0C and result in films of melt water, everywhere. Wasn't there a finding last year that dark colored bacteria were infecting the ice at higher elevations than previously? In support of Aaron's analysis, there's a helpful non-technical wunderground note by Penn State's Lee Grenci of water vapor effects on snow. I couldn't locate summer 2012 daily dew point maps for interior Greenland though Intellicast provides one for continental US. Below are some pictures from Arctic Report Card 2011 in which Box et al review the literature on snowflakes 'losing their edge' and the optics behind this lowered reflectivity. I don't know if these particular snowflakes represent >0º dewpoint treatment. Aaron is correct water vapor is critical to melt rate. The potential impact of soot on the albedo of the accumulation zone of the GIS could be crucial. The Dark Snow Project has a finite and achievable goal of identifying this impact. This is the year to pursue this project because of the nature of the 2012 summer. I tend to think the role of soot is not as large as is more commonly cited. I look forward to knowing this answer not just thinking what it might be. Narssap Sermia has began a significant retreat in 2009. One of the under appreciated facets of Earth's orbital parameters is that perihelion (point in it's orbit where Earth is nearest to the sun) occurs on about Jan 4/5 of the calendar year. In 2013, perihelion occurred simultaneously with Solar max (the peak output in the Sun's 11 year cycle). Now recall what happened to air temperatures in the red exposed heart of Australia. 54C and new all-time records across half the continent. So what? Right now, the Arctic is protected from these extreme insolation levels by the tilt of the Earth's axis. Thus, Greenland melt is minimized. Fast forward 200 years. Greenland is gone, and the Antarctic ice sheet is destabilizing. It's albedo changes following the same pattern observed centuries earlier in Greenland. Except now, Antarctic bears the full brunt of a merciless Sun. Sea levels are already 69 feet higher. West Antarctica has collapsed. Warm humid winds blow black carbon onto the Eastern dome. How long 'til she melts, folks?